Claire Fenwick is a graduate of the TSA Course at The Survey School. The aim of the Course is to equip surveyors with the professional and practical training they need to work as a geomatics surveyor. Company membership of TSA requires the business to produce work of the highest professional standard. After studying for a BA Honours degree in Graphic Design at KIAD (Kent Institute of Art and Design), Claire decided to change career completely. Geomatics surveyors work outdoors, and the role offers considerable opportunities for travel which also appealed to Claire. 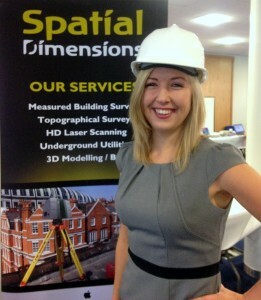 She chose to retrain as a Geomatics Surveyor at The Survey School in Worcester at the age of 23. Claire graduated from the TSA Course in Surveying and quickly progressed from trainee surveyor to senior surveyor with Maltby Land Surveys, one of the UK’s leading survey companies. After relocating to Sevenoaks, Claire joined a small local surveying company and worked her way up to manage large survey projects. In 2011, after having her second child, Claire left, to work for herself, freelancing on behalf of large surveying companies across the UK. As part of this role she also offered survey software training, helping other companies progress into digital site surveying. Claire was inundated with work and soon had to employ additional staff. She invested in the latest survey technology and with a mission to provide outstanding customer service, Spatial Dimensions started trading in October 2012. Spatial Dimensions survey, measure, map and model, land and buildings, mainly working within the Architectural, Engineering and Construction industry. They cover all elements of surveying, and undertake utility surveys, subsurface mapping as well as aerial surveys and inspection using small unmanned aircraft. As one of the leading innovators in modern 3D surveying techniques, including, laser scanning and photogrammetry, their work in SCAN2BIM has attracted new clients from a variety of sectors. They are now privileged to work with many of Britain’s top architectural practices and have had ongoing involvement in some impressive construction and refurbishment projects. 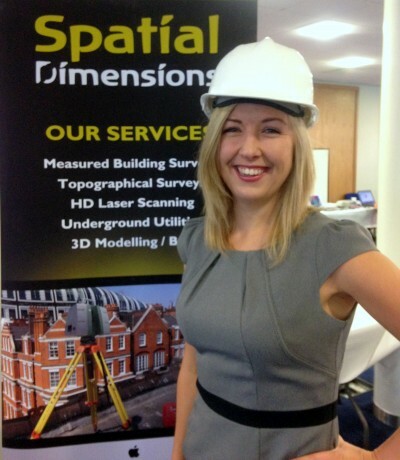 In 2016 Claire won the Kent Women in Construction Award, helping Spatial Dimensions raise their profile within the industry. She also speaks regularly at local schools and colleges on the topic of careers in construction for young people. As part of this, she actively promotes careers in the built environment for females, to try and redress the gender imbalance and skills shortage in the industry. Claire loves her job and enjoys being part of an ever changing and growing industry.